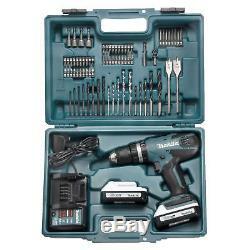 Makita HP457DWE10 18V Li-Ion 1.5Ah Cordless G-Series Combi Drill & 74 Piece Accessory Set. Produced to a quality far exceeding that of DIY products, this Makita 18V G-Series Combi Drill has a different battery platform to the Makita LXT range. It is powered exclusively by the G-Series battery and DC18WA charger. It is a cost effective option for Trade or DIY use. The Kit also includes a comprehensive 74 piece accessory set built into the lid of the carry case. 0 - 400 rpm/0 - 1400 rpm. Drill, 2 batteries, charger, 74 piece accessory set and case. The item "Makita HP457DWE10 18V Li-ion G Series Cordless Combi Drill 2 x 1.5 Ah Batteries" is in sale since Thursday, October 25, 2018. This item is in the category "Home, Furniture & DIY\DIY Tools & Workshop Equipment\Power Tools\Cordless Drills". The seller is "tooltankuk" and is located in Wakefield, West Yorkshire. This item can be shipped to United Kingdom, Antigua and barbuda, Austria, Belgium, Bulgaria, Croatia, Cyprus, Czech republic, Denmark, Estonia, Finland, France, Germany, Greece, Hungary, Ireland, Italy, Latvia, Lithuania, Luxembourg, Malta, Netherlands, Poland, Portugal, Romania, Slovakia, Slovenia, Spain, Sweden, Australia, United States, Canada, Brazil, Japan, New Zealand, China, Israel, Hong Kong, Norway, Indonesia, Malaysia, Mexico, Singapore, South Korea, Switzerland, Taiwan, Thailand, Bangladesh, Belize, Bermuda, Bolivia, Barbados, Brunei darussalam, Cayman islands, Dominica, Ecuador, Egypt, Guernsey, Gibraltar, Guadeloupe, Grenada, French guiana, Iceland, Jersey, Jordan, Cambodia, Saint kitts and nevis, Saint lucia, Liechtenstein, Sri lanka, Macao, Monaco, Maldives, Montserrat, Martinique, Nicaragua, Oman, Pakistan, Peru, Paraguay, Reunion, Turks and caicos islands, Aruba, Saudi arabia, South africa, United arab emirates, Ukraine, Chile.